Season the foie gras, vacuum it in a shrink bag and steam at 57° in the oven. 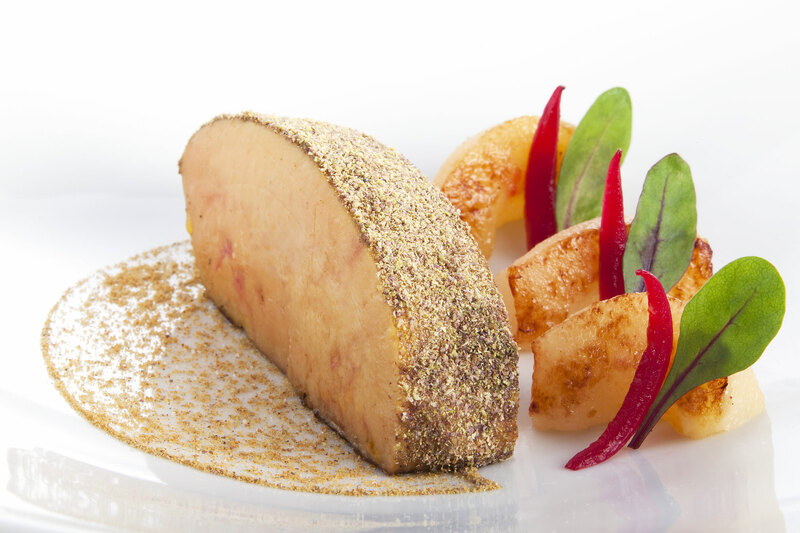 Turn down the oven to 57° as soon as the foie gras has reached 50° and keep on steaming at 57° (about 30 minutes). Cool it down gradually, let it rest on a cooling rack, cool it 10 minutes in cold water and 10 minutes in ice water. Then roast the foie gras in a pan until coloured and then place it in the oven at 150°. As soon as it has reached 40°C, take it out and place it on the cooling rack. Lacquer with some veal stock and sprinkle it with some of the gingerbread crumbs and blackcurrant pepper. Then slice the foie gras. Peel the pears and put them under vacuum with the lemon zest, the starred anise and the syrup. Steam them at 90° for about 40 minutes and cool them down in very cold water. Cut them into quarters and caramelize them with ghee. Peel and cut the onions into petals and cook them together with the port, vinegar and beetroot juice. Season, whilst the onion petals are still slightly crunchy, take them out of the saucepan. Sweat the duck carcass to obtain some juice. Deglaze three times. Caramelize the onions and brown the vegetables. Add the vegetables to the carcass and deglaze it with the soy sauce and the English sauce and wet it with some spring water. Slimmer for 30 minutes, cover with clean film and leave it to infuse for 3 hours. Sieve and reduce down until you get the desired taste. Season. Add the blackcurrant pepper just before serving. Lay out a semi-circle of grounded gingerbread on the bottom of a soup plate. Place 3 quarters of the caramelized pears, 3 petals of red onions and 3 spinach leaves on the plate. Lay out a slice of foie gras and serve the consommé separately. This recipe has been created by the Restaurant Lameloise, Chagny, France and is displayed and kindly shared by the Cassissium.